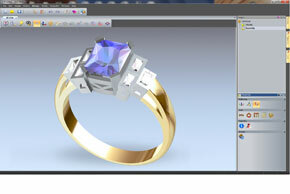 Delcam will offer free copies of the company’s ArtCAM JewelSmith jewellery design software to all customers that sign up for its rapid prototyping bureau service, rp.delcam.com, at the Spring Fair to be held at the NEC, Birmingham, from 6th to 10th February. To qualify for the free software, clients are required to pay for initial training and commit to purchase 18 models each quarter. Provided that this quantity is maintained, all software upgrades and maintenance remain free of charge. The RP bureau service is aimed mainly at companies in the jewellery industry but will also be attractive to all companies concerned about the cost of purchasing high-quality RP machinery for the production of smaller models. The cost for producing any prototype depends on its size, with a typical ring model costing only £25. The main focus is on the supply of 3D models for use in the lost wax casting process. The use of rapid prototyping can be more cost-effective in many cases than machining wax models. Once the customer has signed up for the service, ArtCAM JewelSmith files, or any other 3D files, can easily be uploaded to the Delcam FTP site for quick, automated quoting, based on the size of the model. Once the quote has been accepted, a robust castable prototype will be supplied within 48 hours for companies to use either in their own casting process or to supply to any third party casting company.